My father was an enigma to everyone, his three children not excepted. Perhaps even to himself. He was the most reserved but intelligent man any of his peers had encountered. He said so little that you might have thought him border line autistic except what he offered when he spoke was so insightful, sometimes scary smart, that his companions often fell silent in response, which rendered Orvald even more withdrawn. Raised at a time and in a place that did not value the gift of the gab, Dad was the opposite of a good conversationalist but paradoxically many were eager to devour his scarce words. He didn't want discussion, much less reverence. What he longed for was the unending privacy and stillness that accompanies anonymity. Orvald Arthur Gratias was known for his extraordinary modesty. I unearthed his dusty doctoral thesis years later as the family house was being turned inside out on moving day. As theses go, it was not outwardly impressive, a scant eighty pages of formulae and diagrams. What caught my attention was the enthusiastic note scrawled on the inside cover by one of the examiners. "Congratulations Orvald, my finest student"
"Dad is he the Bertrand Russell?" He was. End of discussion. That one of the most eminent philosophers and mathematicians of the twentieth century had praised his work was of no consequence to Father. Only drew attention to him. "was man of wonder to me. He was an expert blacksmith, veterinarian, carpenter and stone-mason. He moved from Iowa to North Dakota where he bought up land." Dad's father, another O.A., Otto Albert, and his mother, the Norwegian Ingeborg Bjorlie, were attracted to opportunities further north. In 1909 when he was six months old, his parents moved to Saskatchewan, farming first in Zealandia before purchasing a quarter section in 1918. The nearest hamlet was Gowanbrae outside the town of Kinistino, north of the provincial capital of Saskatoon. When at age twelve, Orvald lost his father to pneumonia, he and his older brother Percy, took over the back breaking work that was pioneer farming. The origin of the unusual name of Gratias is uncertain. We know that his grandfather, who had the customs and dialect of the Saxons, was born in Prussia. His forefathers came from that part of Italy that was always changing hands as the Austro-Hungarian Empire expanded and contracted. There is a reference to a Gratias as commander-in-chief of the royal army under the Italian King. Our Latin roots are easier to decipher. Gratias is accusative plural of a first declension noun, 'gratia' meaning grace, charm, or gratitude. Orvald bequeathed to his three children the advantage of a most unusual surname shared by only a few dozen others in N orth America. The twins especially revelled in its singularity. Deo and I had great fun explaining the correct pronunciation - not phonetically 'grah-tee-ahs' but the more refined 'gracious' like 'goodness gracious'. That bit of coaching usually earned a smile and a compliment. With the death of her husband in 1921, Ingeborg was left to raise the four Gratias children and run the family farm. My grandmother was a matriarch as tough as the barb wire she strung around the homestead. Pockets were empty and prospects dim. Life in Gowanbrae was lived at a subsistence level with the hope that honest labour would eventually be rewarded in this world or the next. Percy and Orvald helped to break the 160 acres of land, driving a team of four horses toward the horizon for days at a time, turning around and cutting another strip on the way back. Together the two oldest worked the stumps out of the rich black loam. They chopped and shaped the logs in building the farmhouse. When Evelyn and Herbert, the youngest of the four children were old enough, they joined in the daily routine of chores. This was their life, building strong bodies and solid characters until high school was done when everyone could devote full time to farming. The high school principal would have none of it. Mr. Laird said something to Ingeborg in late spring 1924 near the end of the school year, that bit about Orvald being gifted. "Your son may be shy but he has special talent" Mr. Laird persisited, "He must go to university. Let the seed blossom." Ingeborg knew the value of an education. Both she and her sister Karen, were trained as teachers. When the sixteen year old, the strapping lad who could do the work of two, left Gowanbrae to attend the University of Saskatchewan in Saskatoon, it was not just with his mother's blessing but her insistence. By the time he arrived at the campus, the six foot farm boy was already seen as an athlete of promise. He took advantage of his work ethic, his ability to rise before dawn and work past dusk and spend the weekends in the physics lab. He found time to play intercollegiate basket ball and rug by. But it was his four years on the track that he made an all out assault on the record book. With thighs as big as oil drums and biceps like balloons, his best event was the hammer throw. He was build for power, controlled power with fluid movements, "part granite, part velvet" Coach Griffith liked to boast. In his five years at university the intensely private seedling more than blossomed, graduating at the top of his class in 1930 with a Master of Science degree. He was named Saskatchewan 's most versatile athlete. The legendary Joe Griffith described Orvald as the greatest all around athlete ever to wear the green and white. But Dad had no time for that type of talk. He hated the spotlight. He wanted to get back to the farm and the quiet of the back forty. Deep in the winter of 1930 going on twenty one and finishing his Masters Degree, he came home for the Christmas holidays. Everything was going fine he said, just fine. The announcement came as a surprise to his mother on January 7, 1930. Dialing two long and three short, a newspaper reporter from Saskatoon reached the Gratias farm at Gowanbrae. Ingeborg answered on the party line allowing her conversation to be shared by anyone in the district who happened to listen in. "Your son has been awarded a Rhodes Scholarship to Oxford "
"Oh my goodness... a Rhodes Scholarship " Ingebord exclaimed. She cupped the receiver and turned to Orvald. "I can't believe it," she said, " isn't that great." Dad wasn't so sure. More hoopla and hype than he could manage. He had a ready excuse to turn down the Rhodes. The scholarship paid for everything once the nominee was in England but not the fare over. "Mother we cannot afford to get me to Oxford. Best that I decline and let someone else take advantage of it." Ingeborg knew her laconic son meant what he said but a Rhodes was the best thing to happen to Gowanbrae in years. Grannie Gratias was a resourceful person. She put the word out to neighbours and friends that the family needed a little help to get the recluse on his way to Oxford. The summer of 1930 was busy for the Gratias clan as the communities around Kinistino pulled together a series of bingos, barn dances and bake-offs to raise two hundred and twenty five dollars to get their star student on the Aquatania sailing out of Montreal. "The scared young man right out of the back woods" took up his digs at Brasenose College, Oxford in September of 1930. 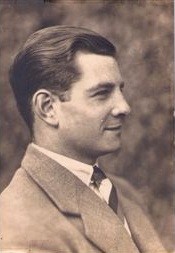 Unlike many Canadian Oxonians who settled into the easy going undergraduate life of the time, Father immediately started a doctorate in physics under the hyper urbane Frederick Lindemann, later Winston Churchill's chief science adviser during the Second World War. Orvald's specialty was radioactivity and he was soon publishing papers in the Proceeding of the Royal Society with such titles as 'The Half - Value Period of Uranium Y'. At the same time he resumed training in the silent man's disciplines of the discus and the hammer. He also turned to lacrosse and hockey, becoming a fixture on England 's national hockey team that won the Spengler Cup as European champions two years running. His life at Oxford was the lab and the sports field, leaving Snooks, a nickname he picked up along the way, no time for sipping Pimm's in the garden or punting on the river. My father was a born researcher and had he come along a few years later, his understanding of particle physics would have found a very practical application. But in 1933 with the Depression at its height and nuclear energy still a figment, he needed a job and radioactive branching didn't cut it. Fortunately Scotland came looking. J. and P. Coates, the huge thread manufacturer based in Glasgow hired the young doctoral graduate and sent him to Montreal where he was charged with developing a Canadian side of the textile operation. He took up his position in the summer of 1932, forfeiting his participation in Games of the X Olymipad in Los Anglos where he had been selected to compete in the hammer throw. Orvald and business did not belong together. The marketing, the promotion, the unions, all things he was not good at, all skills he lacked. It was not that he was a sociopath or uncomfortable with people, it was just that he was so naturally reserved. He longed to be back at the bench in the lab investigating something unknown. But the brass in Scotland liked what the Canadian newcomer was doing, building the business and adding capacity across the country. With his relentless sense of hard work and self-improvement, Father was elevated to Executive Vice President then President of the expanding thread manufacturer. But inside, at the delicate point of equilibrium, O.A. was getting out of balance. The farm boy far removed from the Prairies didn't know how to handle the increasing public and social responsibilities of his position as the top guy for J.& P. Coates in Canada. Then along came Betty. The vivacious rich Elizabeth Constance Plaunt with a keen eye for a husband, is introduced to the bright star and handsome Rhodes Scholar over cocktails at the most elegant of addresses. As an enticement for his last daughter to join them, her Papa, F. X. Plaunt had recently moved into a vast apartment in the Glenealges, a cooper roofed castle like fortress where Cote des Neiges divides Westmount from Mount Royal. My mother, the youngest of six children, so far removed from the next eldest that she felt she was a mistake, was anxious to begin a new life. The ancestral roof at 1 Clemow in the central Glebe section of Ottawa had become claustrophobic since her gentleman in uniform, the deepest love of her young romantic career, had walked away from their betrothal. For reasons that are lost to our family history, perhaps because he was a prescient young man, the newly minted Lieutenant Roger Rolley decided the union with Elizabeth was not a good idea. My twenty three year old mother was left at the altar in heartache and ready for a move to Montreal. My parents wedding reception was at the St. James Club in Montreal on June 18, 1938. Old English Montreal at its WASP ascendancy came out in style, two hundred and fifty guests dressed in couture and regalia, to celebrate the wedding of Elizabeth Constance, the youngest child of lumber baron Francois Xavier and Mary Butterworth Plaunt to Orvald Gratias, scholar, athlete and businessman extraordinaire. Obscured by the pedigree of the revelers and attractiveness of the couple walking down the aisle, was a basic incompatibility of the newly weds. A long fuse ready to be lit. 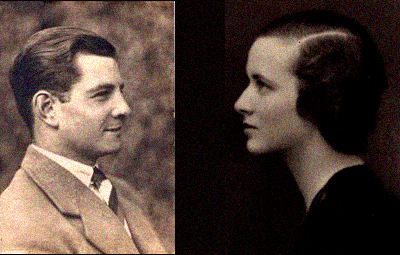 'Betty', Daddy's little girl, the jilted debutante who sought the limelight, and 'Valdo' the austere scholar who knew only hard work and self reliance, was a marriage destined to crumble. Within a few months of settling into their own digs in the Gleneagles, a few floors below her parents, Mother's boredom took grip. Dad was travelling all the time and she wanted to have fun, not wait out his long absences at company headquarters on the outskirts of Glasgow. Initial indiscretions morphed into affairs and inordinate drinking. Dad was a teetotaler not on principle but simply because he had never had time to socialize. He did not drink at all until he was introduced to Montreal society and the martini culture Mother adored. He felt he had to keep up, keep going and then obliterate everything he knew to be going on behind his back. The birth of four children held things together intermittently, staving off mother's complete abandonment though not her regular and lengthy disappearances. First Anna in 1940, then Elizabeth in 1942 who died a crib death less than a year later, and finally the twins, Deo and Alan, in 1946. Father was constantly on the road building the Coates brand in Canada. Mother was off entertaining her gentlemen callers with frequent sojourns with her sister Fran in Manhattan, Eleanor in London, and Manny in Florida, enjoying numerous cocktails at all stages. For a long time the three siblings were oblivious to the domestic turmoil, left in the care of a succession of nurturing French Canadian nannies from the Gaspésie region of Quebec with names like Lorette, Lorraine, and Emelda. But as we got older, the rage, the booze, and the police escorts began to take their toll of each of us in different ways. Throughout his life, O.A. 's refuge had always been learning which had far more appeal than liquor or parties. His first love was knowledge where like at university he could sit at the back of the classroom, listen, absorb and think. Best of all he could walk to McGill University from our house just off Westmount Boulevard where we had moved to from Town of Mount Royal. Montreal is the second biggest French city in the world after Paris but at this stage we lived in a ghetto of rich anglos with stone houses build into the side of a mountain. With elevated views of the downtown skyline and the vibrant harbor on the St. Lawrence, Westmount was and is, an enclave of privilege and power. We lived in a modern townhouse where Trafalgar Road ended at a reservoir converted to a park. The upside down house with bedrooms downstairs and large living spaces upstairs was avante garde at the time. Its floor to ceiling windows offered long views over the park and the valley that was the corridor between Mount Royal and Westmount. My parents' marriage was a disaster. It was also scandalous. Along the way, almost twenty five years into the marriage, Dad begun to accept that his wife was going to lead her own life, coming in and out of the marriage like a weather pattern that can not be predicted. He came to terms with his drinking, joined AA, and then not touching a drop for the last twenty five years of his life as he had not for the first twenty five. Abstinence was not difficult for him. Having accepted Mother's dysfunction and the reality of their mismatch, he was able to go cold turkey. He never enjoyed the taste of booze which was a coping mechanism for the domestic chaos around him. But the damage in the family could not be undone. The house had collapsed unto itself without revealing all its ruins. Orvald returned to the solace of learning, taking evening courses at McGill University for as long as I can remember. He would come home from the office, have a quick dinner, usually alone, and walk twenty five minutes to the campus carved into the side of Mount Royal . The degrees he earned were for fun. The Masters of Buisiness Administration and Certified Financial Analyst designations meant little to his ongoing work at J.& P. Coates, or Atlas Asbestos but had a big impact on his sanity. His return to his roots in scholarship kept him from falling off the edge. After a ten year stint as President of Altas Asbestos where he went after losing his job at Coates because of the drinking, Orvald left the world of manufacturing so alien to his temperament, for good. At sixty he was done with boards, management, unions and the people and PR skills required. And no more benders. Betty came and went in her accustomed manner, returning home when she felt lonely and partied out. Then after a stint of domesticity, she went off again with a new lover. At that point, Dad did a very sensible thing. He returned to his first love of measurement, but this time it was the mathematics of financial markets. In 1966 Orvald joined a small investment house that went by the very English name of MacDougall, MacDougall, MacTier. 3MACS was old money in old Montreal. The boutique firm remained one of few independents left after the law changed to allow the big Canadian banks to buy and integrate stock brokers and investment advisors. Conservative, dignified and protestant, 3MACS offered sanctuary to a fellow Oxonian who represented the values they liked. As a analyst away from the limelight, Dad was again doing research in the back room where he became an in-house guru of market movements. At his memorial service there was testimony from one Etienne Forest , the long serving security man who had the responsibility to open and close the 3Macs offices each day. He spontaneously took the microphone with a story of how he would arrive at seven am to unlock the door to find Orvald on the threshold reading the papers, eager to get to work. Always polite and soft spoken, Dad got into the habit of buying Etienne his first coffee in the hope he might arrive a wee bit earlier. After five years of this ritual, Etienne made an extra key for the early bird. Dad could now leave the apartment before six in the morning for the walk down Drummond along Ste. Catherine to his stacks of research papers. On his retirement from the firm the Chairman, Bart MacDougall spoke of " the extraordinaire man in our midst who worked with little fuss and no bother.an outstanding analyst.a diligent acquirer of knowledge who was happiest doing research of any kind...a gentle man loved by all." My father stayed at 3Macs for twenty six years, working full time until a few months before his death. Or almost full time. At his eighty fifth birthday dinner which my twin Deo hosted at his Rosedale house in Toronto , Dad made an impromptu announcement. Completely out of character, he clinked his glass and rose, asking for a recharge of soda water. The corks popped on champagne for the rest of us. We were all taken aback by this gesture because he rarely joined the raucous din on these family occasions. But it was his birthday and I thought he might declare his retirement given the real issues in dealing with Mother's Alzheimer's. "I have decided," he paused to tip his glass, "to take every second Friday off." He was serious and dead pan, offended by our howls of laughter. He was thinking 'why are they laughing? I didn't say anything funny.' Deo got so charged, fuelled by the excess of liquor, he disappeared upstairs to prepare for an act he normally only performed at the Christmas party. He dramatically reappeared at the top of the grand staircase in his wife's new bathing suit, pirouetted twice before sashaying down to the dining room, wig, lipstick and all. If Dad didn't the see the humour in his own terse announcement, he couldn't begin to fathom his son, the star banker, as a crossdresser. Way too far from Kinistino. Orvald Arthur Gratias died July 23, 1996 in Ottawa at the age of eighty seven. Officially he died of pneumonia, but really he just gave up. It was somebody else's turn to look after the diva who only wanted to go dancing. The day of the visitation at the Hulse and Playfair funeral home, I escorted Mother past the open casket. He was dressed in his Oxford blazer, tortoise shell glasses, Braesnose tie and grey flannels. Betty peered at the well dressed corpse with great interest. Who is that man?" she asked in genuine puzzlement, "such a good looking fellow." "Look after Mum," Dad implored from his hospital bed quarantined from the rest of the floor, "she's not well." Alan Gratias is the founder and creative director of Gravitatis Entertainment and former agriculture trade negotiator in Ottawa. He has published a book, The Completely Civil Servant (Eden Press), a satire on public service. Valdo Goes to School is a part of his unpublished memoir The Lodger and the Gravitarg.